American physicist mission specialist astronaut 1978-1986. The first American black astronaut to fly in space. Died in Challenger accident. Status: Deceased; Active 1978-1986. Born: 1950-10-21. Died: 1986-01-28. Spaceflights: 2 . Total time in space: 7.97 days. Birth Place: South Carolina. He first flew as a mission specialist on STS 41-B which launched from Kennedy Space Center, Florida, on February 3, 1984. The crew included spacecraft commander, Mr. Vance Brand, the pilot, Commander Robert L. Gibson, and fellow mission specialists, Captain Bruce McCandless II, and Lt. Col. Robert L. Stewart. The flight accomplished the proper shuttle deployment of two Hughes 376 communications satellites, as well as the flight testing of rendezvous sensors and computer programs. This mission marked the first flight of the Manned Maneuvering Unit and the first use of the Canadian arm (operated by McNair) to position EVA crewman around Challengers payload bay. Included were the German SPAS-01 Satellite, acoustic levitation and chemical separation experiments, the Cinema 360 motion picture filming, five Getaway Specials, and numerous mid-deck experiments -- all of which Dr. McNair assumed primary responsibility. Challenger culminated in the first landing on the runway at Kennedy Space Center on February 11, 1984. With the completion of this flight, he logged a total of 191 hours in space. Ronald E. McNair was born on October 21, 1950 in Lake City, South Carolina. McNair was the son of Carl C. McNair, Sr., and Pearl M. McNair. He achieved early success in the segregated public schools he attended as both a student and an athlete. Valedictorian of his high school class, he attended North Carolina A&T State University where in 1971 he received a B.S. degree in physics. He went on to study physics at MIT, where he specialized in quantum electronics and laser technology, completing his Ph.D. in 1977. As a student he performed some of the earliest work on chemical HF/DF and high pressure CO lasers, publishing pathbreaking scientific papers on the subject. McNair was also a physical fitness advocate and pursued athletic training from an early age. He was a leader in track and football at his high school. He also became a black belt in Karate, and while in graduate school began offering classes at St. Paul's AME Church in Cambridge, Massachusetts. He also participated in several Karate tournaments, taking more than 30 trophies in these competitions. While involved in these activities McNair met and married Cheryl B. Moore of Brooklyn, New York, and they later had two children. After completing his Ph.D. he began working as a physicist at the Optical Physics Department of Hughes Research Laboratories in Malibu, California, and conducted research on electro-optic laser modulation for satellite-to-satellite space communications. This research led McNair into close contact with the space program for the first time, and when the opportunity presented itself he applied for astronaut training. 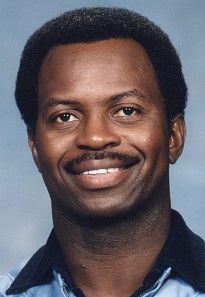 In January 1978 NASA selected him to enter the astronaut cadre, one of the first three Black Americans selected. McNair became the second Black American in space between Febrary 3 and 11, 1984, by flying on the Challenger Shuttle mission STS-41-B. During this mission McNair operated the maneuverable arm built by Canada used to move payloads in space. The 1986 mission on which he was killed was his second Shuttle flight. Departed Date: 1986-01-28. Cause of Death: Challenger explosion.. Degree: PhD. Marital Status: Married. Children: Two children. Education: NC State;MIT. Family: Astronaut. Country: USA. Flights: STS-41-B, STS-51-L. Projects: STS. Bibliography: 12, 4457, 5772. 1950 October 21 - . Birth of Dr Ronald Erwin McNair - . Nation: USA. Related Persons: McNair. American physicist mission specialist astronaut 1978-1986. The first American black astronaut to fly in space. Died in Challenger accident. 2 spaceflights, 8.0 days in space. Flew to orbit on STS-41B (1984)..
Death of Ronald Erwin McNair. - . Related Persons: McNair. American physicist mission specialist astronaut 1978-1986. 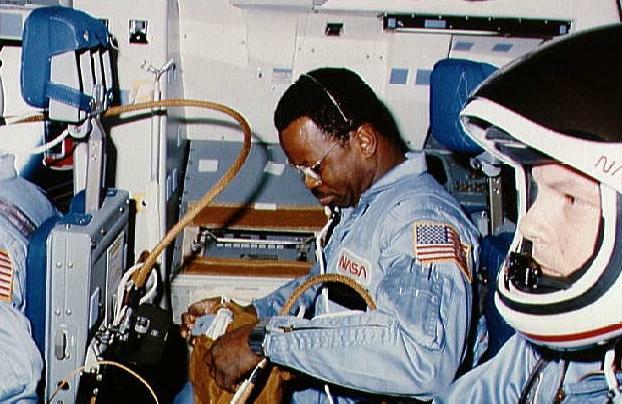 The first American black astronaut to fly in space. Died in Challenger accident. 2 spaceflights, 8.0 days in space. Flew to orbit on STS-41B (1984)..